Lanecia Rouse Tinsley is a creative based in Houston, TX & her work includes photography, painting, mixed media, teaching, writing & speaking. Studio D at Hardy & Nance Streets Studios is where her creativity often blooms. Most days you will find her there sipping on a cup of coffee with music playing as she creates work that reflects what life has revealed to her about healing, freedom, and beauty found in everyday experiences. Acrylics, pastels, charcoal, paper, and encaustic wax are my mediums of choice. She is currently in partnership with Holy Family HTX serving as their Artist-In-Residnece. Click HERE to learn more about that partnership. Life has taught her that we all have creative potential and the need to encounter beauty. 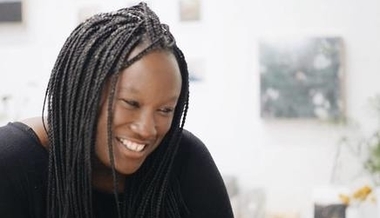 As an artist, she believes her call is to create opportunities for people to encounter beauty through the work of her hands & the spaces she cultivates for them to tap into their creativity. It is an absolutely delight for her to create art that draws people into spaces of vulnerability, hope, complexity and freedom. Lanecia has a Bachelor of Arts, Sociology from Wofford College and a Master of Divinity from Duke University Divinity School. How does experiencing beauty and delight nurture hope? What does art have to do with prayer? Love will not leave you...Beauty will come.